Is your shop air safe??? 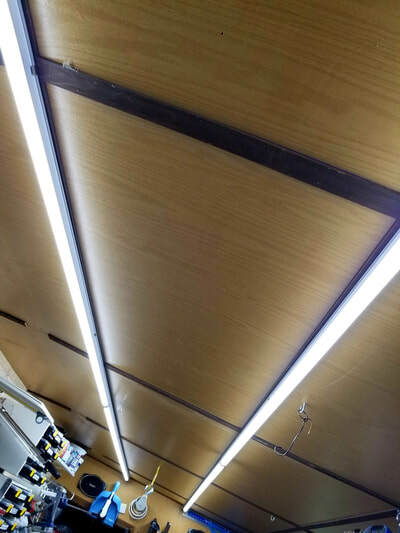 For decades my shop had standard 8' fluorescent light fixtures. They were great for occasional projects but when I started working full time out of my shop I needed more light. I started by adding 4' LED lighting fixtures over the areas where I worked the most. I strung cords across the ceiling to power those fixtures. That improved the lighting but it still wasn't great. 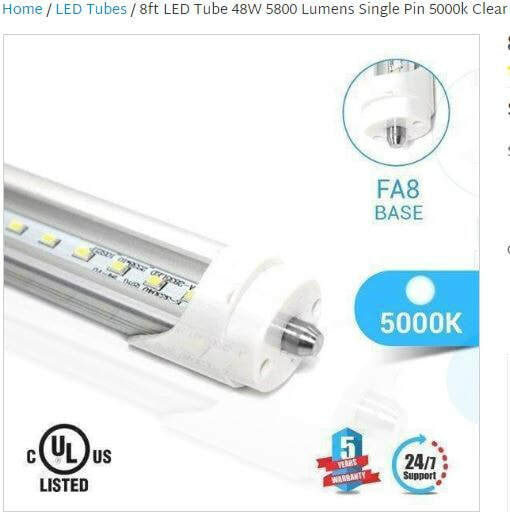 I saw a Facebook ad from LED My Place that showed a LED bulb that could replace the 8' fluorescent bulbs in the fixtures that I already had in place. LED My Place is not sponsoring this article in any way. I'm giving them a shout out because I love their product and they offered great service. You can see the first model I bought in the photo below. This is not the bulb that I ultimately ended up using. 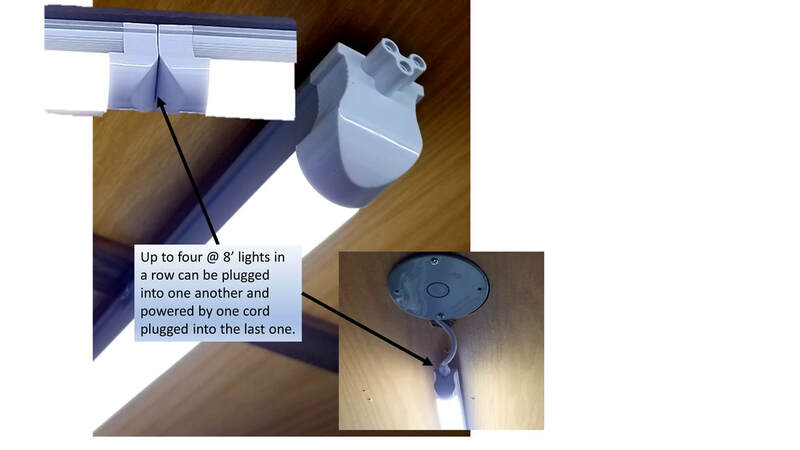 I burnt up several of these lights because I didn't read the instructions which clearly noted to remove the ballast from the fixture before installing the light. 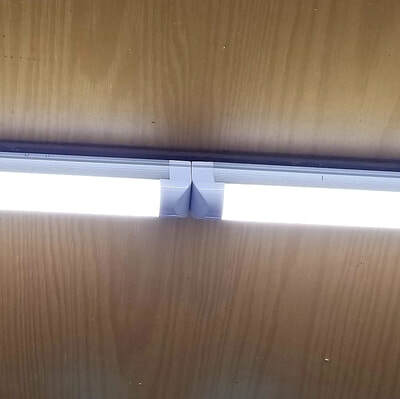 Even with the ballast in place they worked fine when I initially installed them with the power to the fixture turned off. However, when I tried to install a bulb into a fixture with live power on it blew the light. I went back to LED My Place and told them what I had done. They were kind enough to sell me another set at cost. While I was there they showed me an integrated LED bulb that has almost twice the light output (7800 lumens per 8' light ($3.20 per 1,000 lumens) vs. 5000 lumens ($4 per 1,000 lumens) for the other bulb), doesn't require a fixture and only costs $5 more per bulb ($25 per light) so I bought 8 of them! These lights have a frosted coating which produces a much more even light than the clear tube I had before and they are much brighter than the originals, so I was elated. 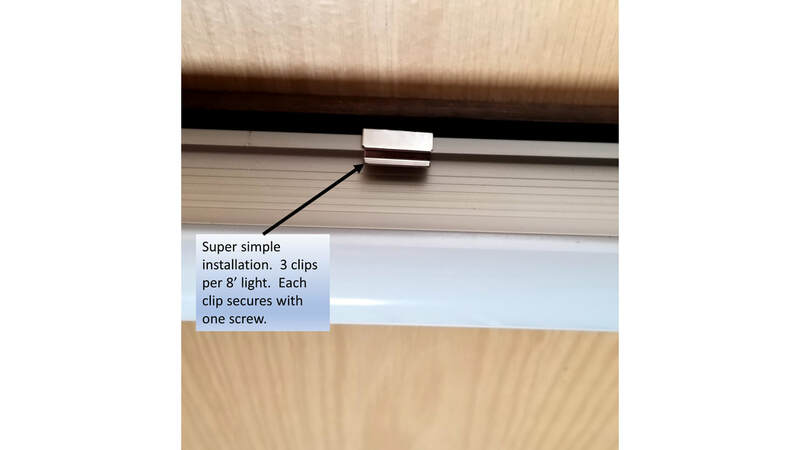 They are super easy to hang with just a very simple clip that screws to the ceiling with one screw in each of 3 clips per light (shown below). If you aren't familiar with LED lighting terminology and options you might feel a little lost when you look at all of the options available. I'll try to break it down to make it simpler. There are really just a few key specs to understand... Lumens, Power, Temperature and CRI. Lumens - the intensity of the light at a given distance and direction away from the light. Power - The amount of energy the light draws over a given period of time (Watts). Sometimes the specs will also say how many watts the equivalent incandescent bulb would draw for the same light output... I.E. 120W equivalent. Most LED bulbs will use less than one fourth the energy of an incandescent bulb with the same light output. Temperature - LED bulbs are all rated by "temperature" which is in units of Kelvin (K) and this essentially is a measure of the color of the light produced by the bulb. Most bulbs will be in the 2700 K t0 6500 K range. The higher the Kelvin the whiter the light. 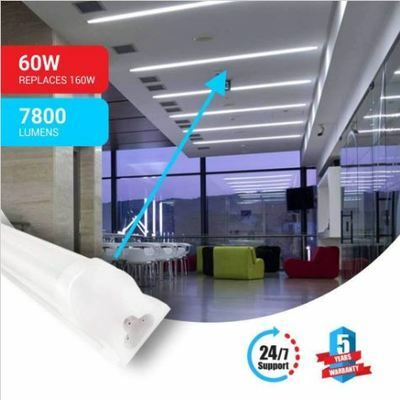 2700 K lights will have a soft yellowish glow which is good for areas where you like to relax such as a den or living room. 6500 K lights give off a much harsher but crisper light and are good for areas where you need to be able to see very fine details such as inspection tables. Ultimately the best temperature lighting for a shop will be different for everyone. 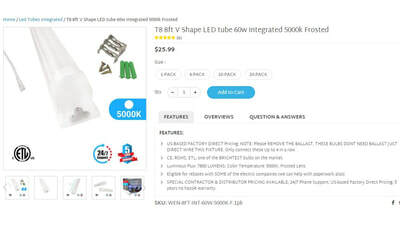 If you are a very extroverted person and like crowds and a lot of stimulation then you will likely want to use bulbs in the 5000K to 6500K range. If you are more introverted and tend to become overstimulated easily then you will likely find 6500K lighting irritating and will likely prefer something under 5000K. CRI - Color Rendering Index - The CRI value represents how close it comes to rendering colors the same as natural sunlight. 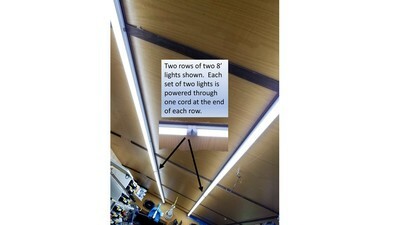 If you plan to take photos or make videos in your shop then try to get lights that have a CRI > 90. Studio lighting can have CRI values over 98 but you have to balance cost vs. quality for your particular situation because very high CRI rated lights can cost more than 2x as much. I chose the LED My Place lights for one simple reason... Lumens per dollar. These lights put off 7800 lumens (per their specs) and only cost $25 each. That is 312 lumens/$. I looked at several other lights and none came close to putting off that much light per $. I was leery because "lumens" can be a subjective measure but in the end I was extremely pleased. One of these 8' lights puts out more than 2 of the fluorescent bulbs I was using before and it draws about half the power. So, I have a very will lit 24'x32' shop for just $200. The CRI of these lights is around 90 which is very adequate for videography. I supplement videos with extra lights but all of my lights are at 5000K so I don't have color grading issues as I move around the shop. Installing these lights is about as simple as it can be. 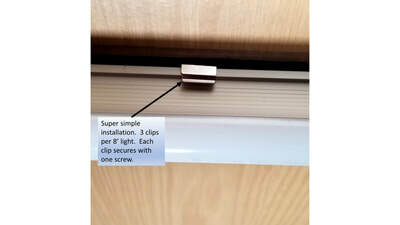 Essentially just 3 screws to hold 3 clips per light and its done. You will have to wire them yourself since they don't come with plugs on the power cords. 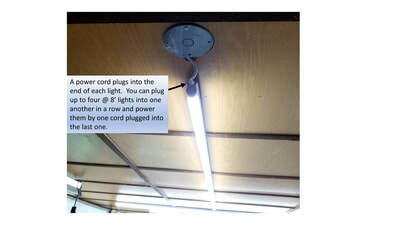 You will also likely need to buy power cord extensions if you don't have a junction box within 2 feet of the power end of each fixture. But longer cords are very affordable. I chose 5000K because it is close to the same spectrum as sunlight and I plan to film videos in my shop. 5000K lights produce a natural looking light that works well with vidiography. Also, I like a bright and stimulating light color. The main work area of my shop is about 16' wide x 12' deep. I mounted three sets of two 8' lights plugged into one another over that area. 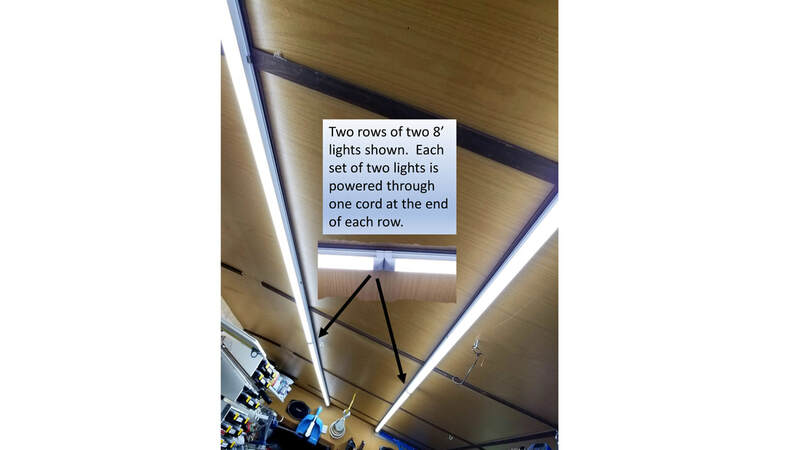 I used two 8' lights to light the rest of the shop which is 24' wide x 20' deep. 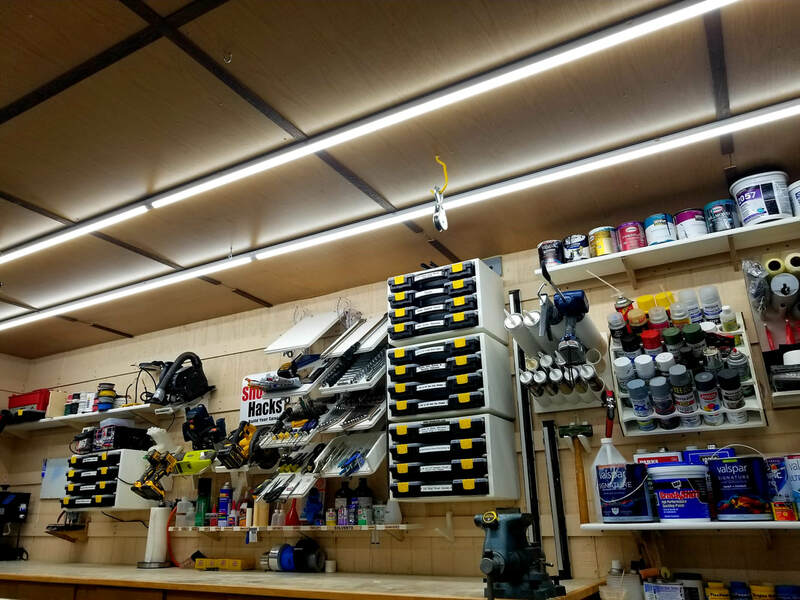 Its a good idea to concentrate the lights over your work area(s) and use them more spraticly in areas where you don't spend as much time if you are trying to save $$. The improvement in the quality and quantity of light in my shop is amazing. Improving my lighting was the last leg of my "floors, walls, lighting" upgrades and it really finished off the upgrade with a bang. I couldn't be more pleased.